Commodity trading and forex trading are the primary methods to trade and two of the markets which are most comfortable to invest your money. Many buyers come to forex and commodity shares because of the low prices of shares in the stock marketplace. In line with the above, many traders are making their fortunes due to the usage of these methods. However, commodity trading and forex trading have their advantages and disadvantages. As mentioned above, trading in forex and commodities has its advantages and disadvantages. So, investors often believe that forex trading is riskier than commodity trading. Investors who do not have good risk-bearing capacity tend to prefer to trade in currency pairs. Forex trading is advantageous as well for those who are ready to face risk as this market is highly liquid, open 24 hours a day and capable of offering some high returns. 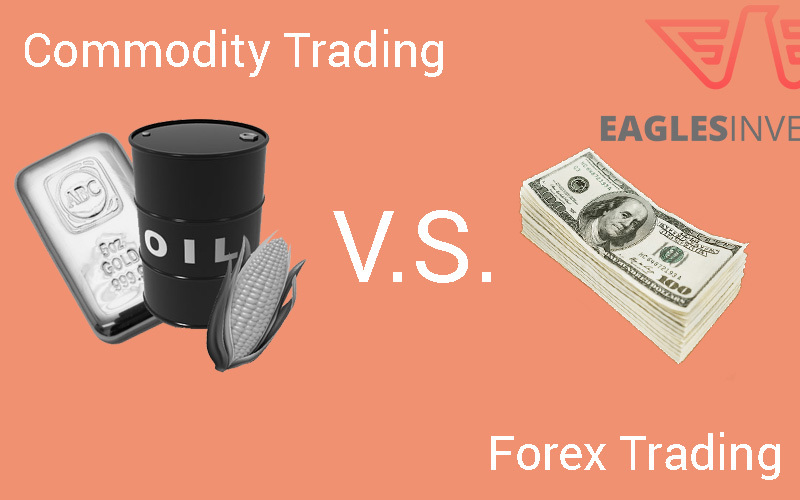 What is commodity trading and what is forex trading? Commodity trading is where investors trade, buy or sell different commodities at current or future date. Commodity trading is done by using futures contracts. In this line, a future contract refers to a deal between a buyer and seller to sell or buy a commodity at a specific price on a stipulated future date. Whereas, forex trading refers to practices of selling and buying of currency. Currencies are traded on large financial institutions and big investors. So, foreign exchange or trading in currency is considered to be the most liquid market around the globe. Anybody can trade either commodities or forex, but trading profitably is up to the trader and his/her trading strategy. It is a personal choice for traders to choose where they would want to invest their money. Both commodity trading and forex trading tend to be exciting and profitable. However, it does not matter which type of trade you wanted to invest your money. The question of ‘which one is profitable?’ is critical. Therefore, it is up to the trader and his/her trading strategy to decide how to make either forex or commodity trading profitable. NB Forex trading has more information available for forex trading, and with the data being less expensive or free, complete with free demo accounts, it is difficult to go wrong with forex trading. When traders invest in commodities trading, they determine if the price of a specific commodity will rise or fall based on whether they believe there will be a good farming season, a bad growing season, increased mining prospects, drought, strikes or floods, etc. Mother Nature plays a very crucial role in trading commodities than it does in trading forex. The unpredictable weather patterns from year to year can impact negatively on the commodities market. Also, if it’s not the weather it could be new mineral discoveries, dry holes, war or a multitude of different events, strikes by miners all of which can change the results for commodity trading. In other words, the possibility of good-sized profit exists in the commodities market; however, there are higher chances of losses due to crop failures, etc. Therefore, traders need to be very careful if they think to invest in commodity trading. Forex trading comprises whether a particular nation’s currency will rise or fall compared to another major currency. When trading in the forex, investors trade currency pairs, i.e., national currency pairs which rise or fall relative to each other. Therefore, forex trading can also be affected by global changes, but they typically have a less dramatic effect than what can occur with commodities. Viewing it from the above perspective one can safely say forex trading is the safer bet of the two. Commodities may be easy to exchange since commodity prices are generally based at once on demand and deliver. Therefore, whatever traded focuses mainly on supply and demand so its trend might be more predictable. Whereas, forex may be smooth to trade if one uses the right trading machine or method. However, forex can also be very complicated especially when one is uncertain about the method or trading strategies to use. Commodity trading may be very profitable; however, it mainly relies on the quantity of money which one uses to begin investing. Forex trading also can be more profitable. Investors have the choice of trading with leverage however even as buying and selling with leverage is volatile, it increases traders ability to make profits. The forex trading is far much better than commodities. Set techniques estimate the forex developments. So, there are plenty of buying and selling strategies available on forex platforms. Foreign exchange signal offers investors the option to exchange with electronic signals which tell them when to trade and what to trade. Commodity trading may be regular; however, one of the methods to expect future values is by way of exploiting market analytics and news. Commodity costs can bounce all over the board depending on weather, crop percentages planted, oil found or not found, etc. Commodity prices can fluctuate around the board depending on demand. Therefore, the fluctuation of prices decreases the amount of trade an investor is expecting. Forex trading is more predictable than commodity trading. Currency charges can fluctuate and become risky at times. So, there are better trends created in forex trading that can follow as compared to the commodity trading. Therefore, this may make it easy to be regular while trading the forex. Information about commodity trading can be reasonably challenging to find, especially records which are free. There is more information available on different platforms, but a lot of it is costly to obtain. Forex information is more accessible as compared to commodity trading. Much of the information is available for free. Traders can also sign up for demo accounts at many forex forums, and traders can try to trade without risking their capital. Demo account makes it easy for a great introduction to forex trading and lets traders know their possibilities in forex trading. Therefore, these demo accounts in forex trading are not available in the commodity trading arena. To sum up the above, it is vital to say that the balance tip favors forex trading. However, traders should always make decisions based on their investment goals and plans. Therefore, consulting and reading more information would be helpful in making the right choice.